Why is it that when you sing in the shower, you can suddenly sing as well as Rihanna – or so it sounds like! Shower singing aside, what is more thrilling than standing before a crowd on karaoke night singing your heart out to a classic song? There is something magical about singing. It infects us all at one time or another. Every culture in the world has music and songs. Music is like laughter: it’s universal. Even little children can sing. 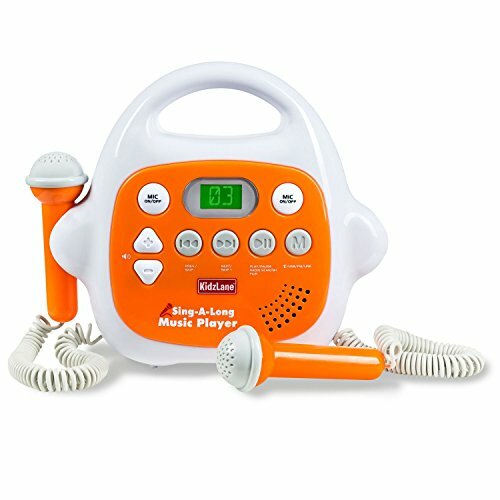 Why not get your toddler started early with a karaoke microphone set? 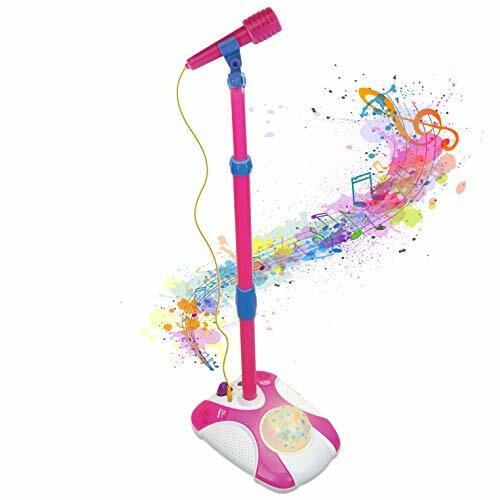 Your child probably won’t be the next Ed Sheeran, but by gifting them the best karaoke machine for kids, you open a whole new world for them. Finding the right kid microphone is not easy, which is why you will love this review. To simplify things for you, we have compiled the best toddler microphones in the market. Safety is always the number one priority when you are considering buying any product for children. They are so delicate and vulnerable. If you buy a karaoke microphone for your kids, will it cause them harm? On the whole, kids’ microphones are mostly safe for kids: as safe as, say, a phone or any battery-powered toys in their possession. Of course there are a few factors which may jeopardize their safety, and we will mention them briefly. First is the materials used to make the toy. Some materials are not safe for use by young children, particularly certain toxic chemicals used in plastics. An example of a toxic chemical is BPA, which is why you will often see many products advertised as being BPA-free. The other thing that could be unsafe for your child is loud volume. If the karaoke machine is playing at a very high volume, it might negatively affect your child’s hearing ability, especially for younger children. Your child could be putting his ear against the speaker and letting all the sound blast in. The third thing is if the karaoke machine is heavy and falls on your child. This is why it’s better to buy him or her a kid-friendly karaoke toy microphone. These mics are usually lightweight and made of kid-friendly materials. All in all, kids’ microphones are mostly harmless. After we have shared our best kids karaoke machine reviews, we will revisit this topic and share some safety tips you can use to keep your child safe. 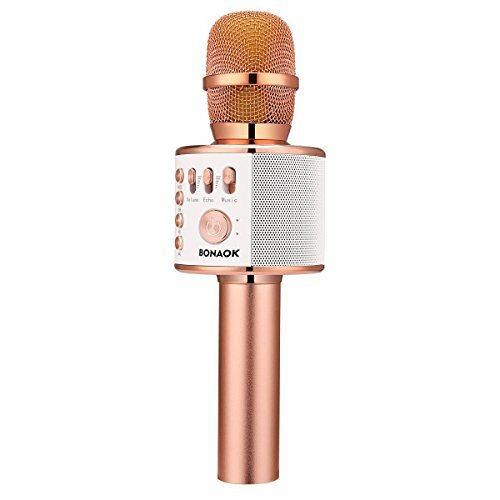 The Bonaok karaoke microphone for kids is specially designed to suit the shape of the hand, to fit nicely in your child’s grip, making it comfortable and easy to hold. Junior and princess can sing their hearts out during family karaoke time without tiring too quickly. It is equipped with a built-in Bluetooth module, which you can also use as a recorder, player, or speaker. In addition, it also allows cable connection. You connect this microphone for toddlers to your phone using Bluetooth or cable, open the singing app on your phone, and sit back to watch your kid tap into their inner Beyonce. The Bluetooth connection is not bad: up to 10 meters distance. The microphone will support a micro SD card with a memory of up to 64 GB, which is beyond enough to store all the songs you could possibly think of. The card is also great for recording yourself – a feature kids really love. The SD card is not included in the purchase. It made it to our best kids microphone review because of its versatility. It’s a guaranteed hit when singing with family, friends, or when travelling. You can also use it with the car stereo. This toy microphone is very kid-friendly. It has a colorful and unique, fun design which catches the eye. It also produces colorful light effects which create an exciting atmosphere when your kid is performing. Children are highly receptive to such visual effects. The sound effects are also fun. You can amplify your singing to squeaky, deeper, echo, robot, or normal. Kids love that. 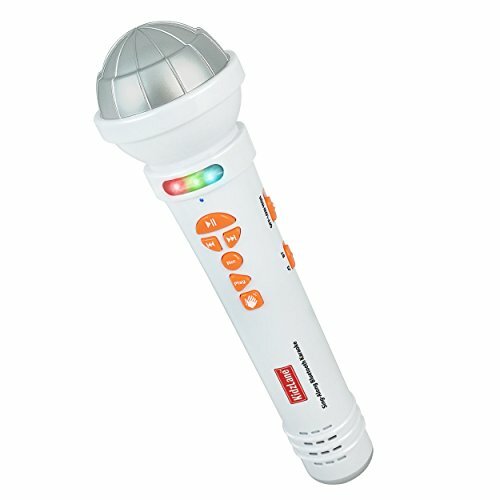 That’s not the end of it – this toy microphone for toddlers also comes with 4 different voice effects, 4 built-in games, 4 original songs, a voice changer, and audience sound effects. The 4 songs are all kiddie songs. 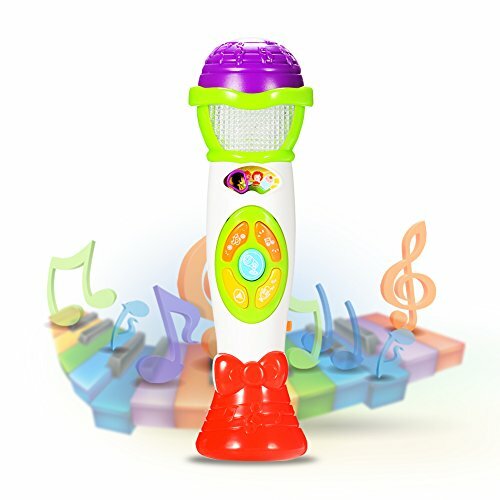 One of the main reasons why this toy microphone could be the best toddler microphone is its ability to remove or reduce the main vocal track in a song, enabling kids to become the lead singer in their favorite songs. This feature is called Music Magic Mode. You can load up your MP3 player or any other mobile device with your favorite songs and connect with the microphone via audio cable. Your kids can access all the songs they like. This could be the best kids microphone. It’s impressive. Not only does it operate as a wireless microphone, but you can also use it as a recorder, a speaker, and it has this amazing, colorful LED light that children just love. The LED light is adjustable and dynamic – the mic features 48 colorful LED lights which flicker in tandem with the rhythm of the music. The higher the volume, the brighter the light becomes. This makes the mic fantastic at parties, and your kid will look very cool handling it at karaoke time. You can make the LED light appear or disappear at will by long-pressing the “M” button. The microphone is seriously high tech. It has a 3-layer filter net which enables you to reduce noise so your voice can be more clearly heard. The microphone also operates as a speaker. By connecting it with your android device using Bluetooth or audio cable, you effectively convert it into a moving speaker. Unlike the others we have looked at, this microphone for toddlers does not have Bluetooth. 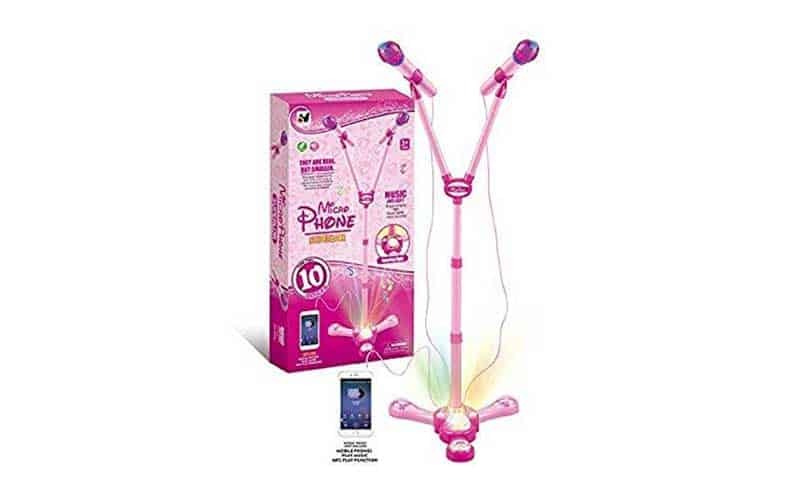 It does have an audio jack which should serve the same purpose of connecting the toy microphone to your smartphone, MP3 player, iPod, or CD player. This particular kiddie mic is for the younger kids – as young as one years old. Buying them a musical toy is a wonderful way to foster the development of your child’s young brain as well as giving them an early appreciation of music. Since the kids who are expected to use this are very young, the toy comes with an easy-grip handle which toddlers can hold easily with their little hands. The voice changing function is especially thrilling to little children. They delight at how the voice changer makes their voice sound either deep or high-pitched. It’s fun to watch a child fool around with the voice changing feature. The microphone also enables sound recording. If you press the recording button, you can make a 30-second recording – not much time, but being a toy for the kids, they will love it anyway. 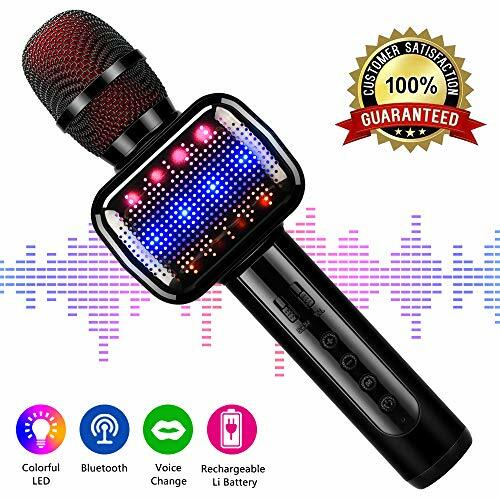 If you are really into karaoke and would like a quality karaoke mic that will help imbue your kids with the true spirit of karaoke, this is the one. It has a colorful water wave LED light that flows with the changes of a song’s rhythm, creating a KTV atmosphere wherever you are. The karaoke mike has a metal filter head that turns down the noise and reduces dust interference, enabling your child’s singing voice to come out with clarity and good echo reverberation through the 5-watt speaker. The mic has 4 voice changes which your children will enjoy fooling around with. You can connect it via Bluetooth or the 3.5 mm audio jack to your Android PC, iPhone, iPad, or other devices. 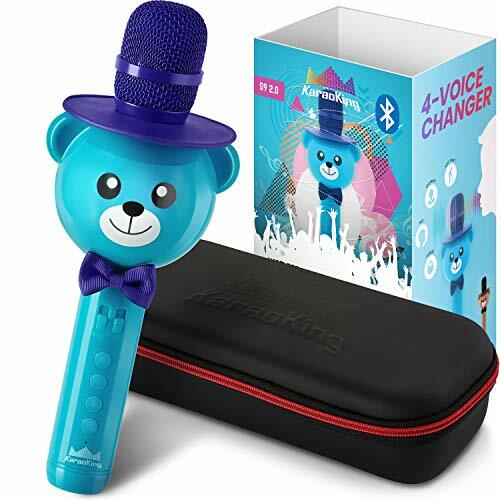 This cute teddy-bear-shaped kiddie microphone is what your toddler needs to discover the beautiful magic of karaoke. It’s available in 4 kid-friendly colors: a blue, pink, brown, or white bear – you can get your kid one in the color they like most. It comes with a voice-changing feature which enables your child to fool around with the sound of their voice. Children find this hilarious. One moment they are singing in their normal voice, the next their voice sounds like an old man, and then a lady, and most fun of all: a robot! One tiresome thing about karaoke machines is having to comb through endless CDs just to find the song you want. This Bluetooth microphone does not have this problem. You can easily connect to your devices, including iPhones and Android phones. This is the best kids karaoke machine for children to get their karaoke on. It is lightweight and easy for a child to carry. If you have two children in your house, you will like this machine because it comes with two microphones. The machine comprises the two mics and the MP3 music player. You have separate volume control for the microphones and the music player. The karaoke machine is equipped with a built-in 512 MB SD card for convenient music storage. You can store up to a 100 songs in it: beyond enough to contain all your children’s favorite karaoke songs. However, 100 is not the maximum number of songs you can access using this machine. In fact, the number is limitless thanks to the variety of external music sources you can access via Bluetooth, USB, aux plug in, or tuning into FM radio. Separate volume control for mic and music player. Your kid is going to have fun with this microphone. It has a built-in speaker, and at the push of a button you can access any of 4 fun musical beats. Children can also amuse themselves, after they have finished singing their hearts out with the 2 crowd noises that are available. At the push of a button, the mic gives out either happy cheers or disappointed jeers. To help you access music from external sources, it has an auxiliary jack which you can plug into your MP3 player, CD player, or smartphone. As your kids grow taller, they can continue to use the microphone since the mic stand has an adjustable height. It may go as low as 28 inches or 116 cm and as high as 46 inches or 116 cm. This microphone is an excellent karaoke machine for children. With its built-in speaker, the microphone will amplify any singing voice. It comes with 10 preprogrammed songs. The songs are all child friendly and your kid will enjoy memorizing and singing along. They include: “If you’re happy”, “Mary had a little lamb”, and “Row row row your boat”. However, these 10 songs are not the only ones your child can access. Thanks to the wireless connectivity, you can connect the mic wirelessly to compatible devices, giving your kid access to a broader variety of songs. Children like bells and whistles: some audio and visual flourishes. 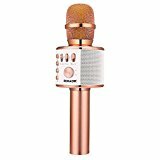 This microphone delivers that with its LED lights and applause function. They give your child the sensation of performing on a stage and being a karaoke superstar. This is great for building their stage confidence and presence from an early age. Karaoke machines are the rare kind of toy that is popular with children of all ages: because the desire to sing and show off your prowess to friends and family does not lessen as you grow. If anything, for some of us, it keeps increasing. For that reason, as the child grows older, you will need to get them a more age-appropriate karaoke microphone. A teenager would be mortified if you came home bearing a toddler’s microphone as a present. Teens and preteens need machines that provide great sound quality, echo, and volume controls. On the other hand, toddlers are too young to understand karaoke microphones that have a lot of complicated functions or buttons. They need something simple and highly intuitive to use. They want something with pretty colors. A toddler’s mic will usually contain preprogrammed kiddie songs like “Mary had a little lamb”. When considering microphone choices for your kids, be very keen to find out what songs are preprogrammed into it. Songs that contain swear words or adult references and topics are not appropriate for kids. Naturally, the more features a microphone is packed with, the higher its price should be. When you are on a budget, you have to make a trade off between certain features and the price. These features include voice changing effects, preprogrammed songs, LED lights, speaker, sound quality, noise reduction, among others. Your child’s age will also, as we have pointed out, play a part in your decision. Certain features may be too complicated for younger children. On the other hand, preprogrammed kiddie songs may be undesirable to the older kids. For the very young children, it’s very important that the microphone be kid-sized. It should not be heavy. The toy mic should be lightweight, easy for the toddler to grip and hold for an extended period of time, something that does not tire their hand. Kiddie karaoke machines are generally made of kid-friendly materials that are sturdy and designed for ease of use. For your child to have access to a variety of songs they can sing along to, it’s necessary that the mic have a means of connection to external sources such as iPods, phones, your laptop, MP3 players, CD players, and so forth. Connection may be via cable or wireless. Mics that have both Bluetooth and cable connection are the best. Are There Any Differences Between Boys and Girls Microphone? 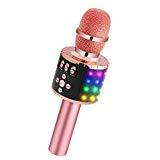 When it comes to karaoke microphones, there are no actual differences between what is good for boys and what is good for girls, not the way you would have differences in something like clothing. 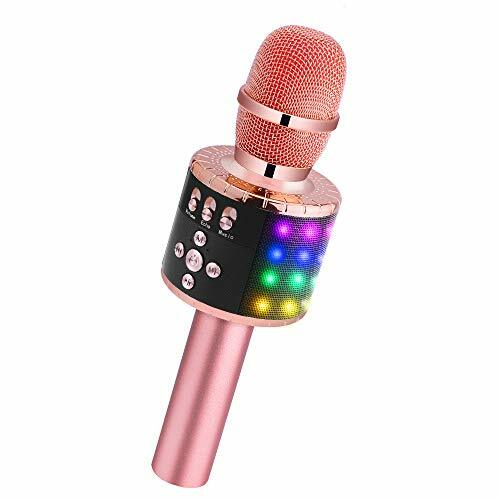 Karaoke microphones that are presented as being appropriate for either boys or girls do so because of the manufacturer or seller’s desire to segment the target market and sell more units. Basically, it is marketing language. Both boys and girls can use any karaoke microphones. Besides, even when a mic is packaged as a boys’ microphone, girls are still likely to want to use it. However, boys will be less likely to want a girly microphone – these are usually pink and themed with what most boys would consider girly cartoons. Kids Karaoke Machine: Any Safety Advice? When purchasing the microphone, or any toy for that matter, be keen to know which materials have been used in manufacturing it. As we noted above, some materials, particularly certain chemicals in plastics, are toxic and unsafe for young children. A good example is BPA (Bisphenol A). Manufacturers and sellers are usually keen to inform you that their product is “non-toxic” or “BPA-free”. High volume played too close to the ear can cause damage to a child’s eardrums. If kids do not use their karaoke machines properly, they could damage their hearing. As a parent or person in charge of a child, one of your responsibilities is to teach the child how to use the microphone appropriately. Teach them never to put noisy toys near their ears. You can also enforce time limits for loud toys. Another thing you could do is only allow them to play with it when you are in the room so as to monitor how they use it, at least until they learn the proper way of doing it. There are also things you can do keep the volume at an acceptable rate. The first trick is to put water-proof tape over the speaker. This will mute the sound. The second trick is to put tape over the toy’s volume control. This will keep the child from increasing the volume to an unsafe level. After reading the article, it’s pretty clear what should be your next present for your child. Let them enjoy the thrill of making melodies with their voice, of performing to an audience (family and friends), and hearing their voice change when they use the voice changing effects. Not only will doing this help their mental development, it will also boost their confidence, creativity, sociability, and give them an early appreciation for music. Music speaks the language of the soul and buying your child a karaoke machine might be the best way to teach them how to speak it!